Every year now, the Gila Woodpeckers (Melanerpes uropygialis) peck holes in every single pomegranate on my tree. Not only does this ruin the delicious fruits, it also attracts numerous Paper Wasps (Polistes spp.) to the opened fruits. 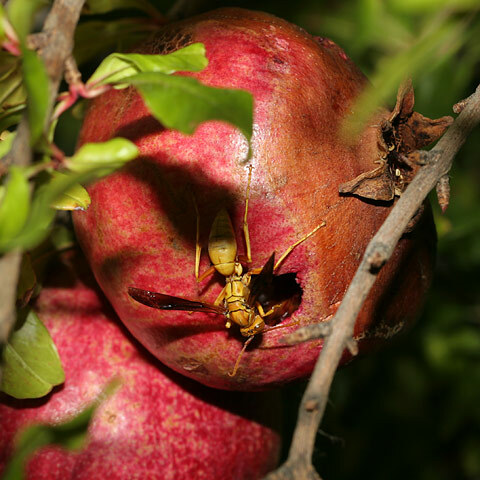 The paper wasps busily crawl around inside the opened pomegranates, and almost every pomegranate has a wasp inside. I don't know what the paper wasps are doing in there, but they may be feeding on the bits of fruit left behind by the woodpeckers. When I approach the pomegranate tree, annoyed wasps will pop out of the fruits and buzz around near me, apparently warning me away from their treasured pomegranates. What a joy, instead of a bumper crop of pomegranates, I now have a bumper crop of obnoxious yellow wasps every year. When left alone by Gila Woodpeckers, Pomegranates (Punica granatum) do quite well here in Tucson, and these small, deciduous trees or large shrubs with their red flowers and red fruits make great additions to any garden… Just beware the fruits with holes in them!